A Sensible Fall; Mario Died; New Mario; Cue The Zombies? I don’t know about the last twenty years — I haven’t been paying attention to console releases that long — but I agree that Fall 2009, while still exciting, has felt less stressful than at least the last four Falls. This is the saddest story that I read all week. I just wonder if the moment was really as sombre as the writer conveyed it. I forgot all about New Super Mario Bros. when I wrote my plans for Fall ’09. It looks amazing; add it to the list. Assuming they aren’t just glorified advergames, Flash games made by a major developer could something great. Moments later, zombies burst through the window. Last time I heard from Shank it was being shown as an Xbox Live Arcade game. Now, fresh from the Penny Arcade Expo, GameTrailers has an extended gameplay video that they’ve filed under the “PC” category. This is great news, if it’s not an error, as the game looks wonderful. At last, a zombie game that isn’t a first-person or twin-stick shooter, but a sim/RPG — and from a reputable developer, no less. By the look of those screenshots, the zombies may even be shambling. It’s refreshing to see a someone in the press willing to play and cover the PC version of a multiplatform game. It’s not even a staggered release, which is usually the only time we hear about a PC version from anyone other than PC-centric outlets. Although I’m wary of putting stock in non-announcements, I want to believe that publishers are coming back around to treating this platform right. By now I hope you’ve noticed common theme in the items I’ve picked this week: the PC is getting its just deserts. News like this is so plentiful lately that it’s on the verge of becoming non-news; I’m okay with that. There was a time when it was acceptable for a game’s sprites and animations to be crude, its fonts illegible, and its puzzles and plot absurd. That was the best anyone could do at the time, and now these games are looked back on as charming, but also as products of a bygone era: something lost in the wake of big budgets, polygons, and bump-mapping. 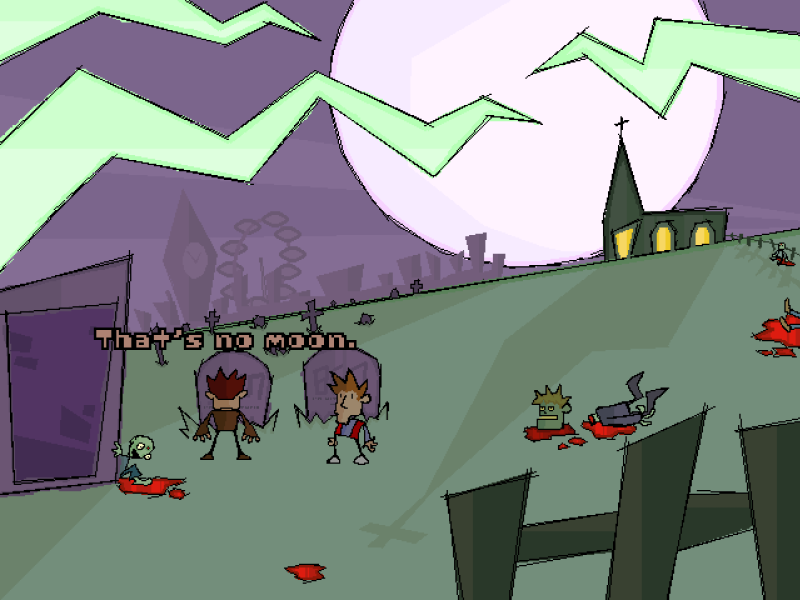 Enter: Zombie Cow Studios with Ben There, Dan That!, a free comedic adventure game designed in the classic Lucas Arts style that gamers have grown to miss. The British stars of Ben There, Dan That! are its own creators, Ben Ward and Dan Marshall. In the real world, Dan handles the coding, the art, and co-writes along with Ben. Within the game, Ben does almost all the heavy lifting while Dan keeps him company, offers funny asides, and stands by for when such erudite tasks as flipping light switches need managing. The latter of which, admittedly, is infrequent; in this particular adventure, Ben and Dan visit a number of parallel realities, most of which are well-lit. What these realities lack in their demand for light fixture manipulation, they make up for in such anomalies as an ever-displaced London skyline, soccer hooligans, zombies, and tolerance for wanton murder.